Posted on April 5, 2018 at 6:03 am. We begin today with an important announcement about SCHOOL SAFETY. 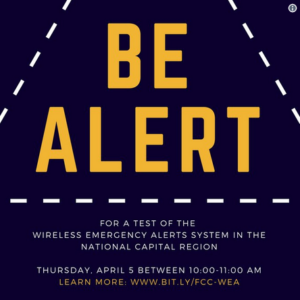 This morning between 10 and 11 a.m. — the Department of Homeland Security will be conducting a TEST of its “Wireless Emergency Alert System” throughout the Metro DC Region — which includes Arlington County. When the alert is sent, every mobile device — like your phone and tablet — will sound an alarm and receive a text message, similar to Amber Alerts. Please be aware that this is ONLY A TEST, and there is no reason for concern. Once again, the test will be conducted between 10 and 11 o’clock this morning. Don’t be alarmed by the alarm!! Calling all MUNers! The WMS Model UN Club will be holding a MANDATORY meeting TODAY during ASP 1 in room 202 for all students participating in the upcoming ADMUN and TECHMUN conferences. See Ms. Carlson with any questions. Attention all TWINS! The WMS Yearbook is featuring a special TWIN section in this year’s publication. If you’d like to be included, all WMS twins are invited to get their pictures taken this FRIDAY during TA in room 136. See Ms. Briones with any questions — and say CHEESE! Calling all 7th graders! How would YOU like to attend one of the highest rated High Schools in the country? Thomas Jefferson High School for Science and Technology is hosting an open-house this SATURDAY for students who might like to apply next year. The session runs from 9 a.m. to noon — and offers students and parents the chance to talk with TJ teachers and alumni, and to learn about its academic programs and admissions process. It should be an exciting day! Please see Ms. Boyers with any questions. And now for an important message from your school librarians! There are HUNDREDS of overdue books out there — and the WMS library needs them back. Remember, if you have TWO or more overdue books, you will NOT be allowed to check out anything else from the library until they’re returned. Overdue notices went out during TA yesterday — and emails will be sent to parents next week. So check your backpack, your locker, and under your bed at home, and BRING IN YOUR BOOKS!!! 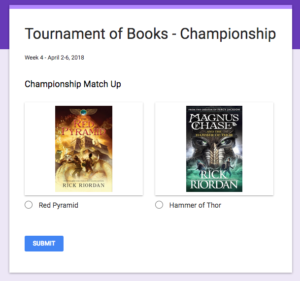 The WMS Tournament of Books has reached the Championship Match — and incredibly, both finalists were written by acclaimed author Rick Riordan! It’s “The Red Pyramid” versus “Magnus Chase and the Hammer of Thor.” Make your pick using the QR code by the cafeteria, or follow the link in today’s Morning Announcements Blog. Which book do YOU think will win the title?? Only ONE can be the CHAMPION — so place your vote TODAY! !